The Johnson Green Cross-Line and Red 5-Dot Combination Self-Leveling Laser is now 400% more visible because of Greenbrite technology. It projects one green horizontal, vertical or one cross-line and two, three or five simultaneous red dots. 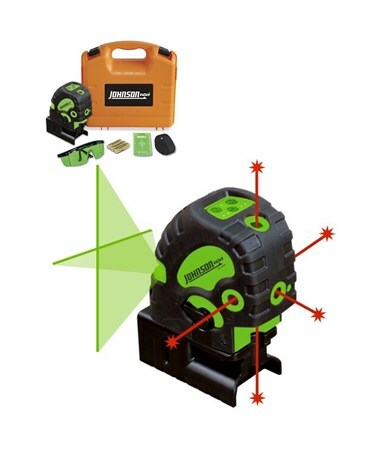 With an accuracy of ±1/8 inches at 50 feet and interior range of up to 200 feet, this laser is perfect for framing and drywall. It also features manual mode for use at any angle. It has a locking mechanism that protects the inner pendulum during transportation. Self-leveling within ± 4 degrees and it comes with audible and visual alarms when beyond leveling range. 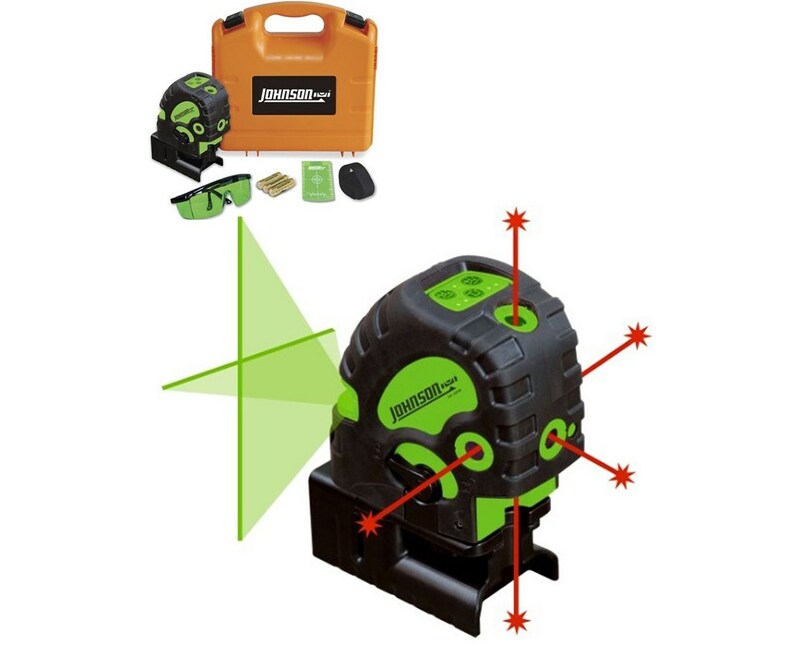 The Johnson Green Cross-Line and Red 5-Dot Combination Self-Leveling Laser are dust and waterproof with an IP-54 rating. 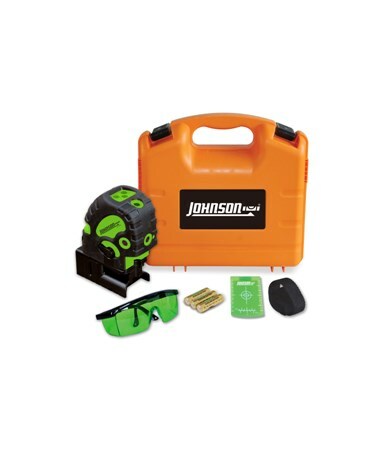 The Johnson Green Cross-Line and Red 5-Dot Combination Self-Leveling Laser comes with multi-functional magnetic base, three "AA" alkaline batteries, mounting strap, magnetic target, tinted glasses, instruction manual and hard-shell carrying case. It also comes with 3-year warranty. Dimensions 4.80" x 2.83" x 4.56"
Leveling Accuracy ±1/8 inch at 50 ft. Working Range Up to 200 ft.
Vertical Accuracy ±1/8 inch at 50 ft.
Horizontal Accuracy ±1/8 inch at 50 ft.